As we move into the South Florida VEGETABLE GROWING SEASON, the University of Florida’s Institute of Food and Agricultural Sciences (UF/IFAS) Extension Florida Master Gardener Martin County Program will present “Start Vegetable Gardening in Martin County” explaining the various ways to successfully prepare, plant, and maintain a vegetable garden in Martin County on Monday, September 18 from 5:30-7:30 p.m. in the John F. and Rita M. Armstrong Wing of the Blake Library, Stuart, FL. Attendees will be able to visit educational tables staffed by experienced Martin County Master Gardeners offering research-based information about vegetable gardening from UF/IFAS addressing the unique requirements for successful crop production. 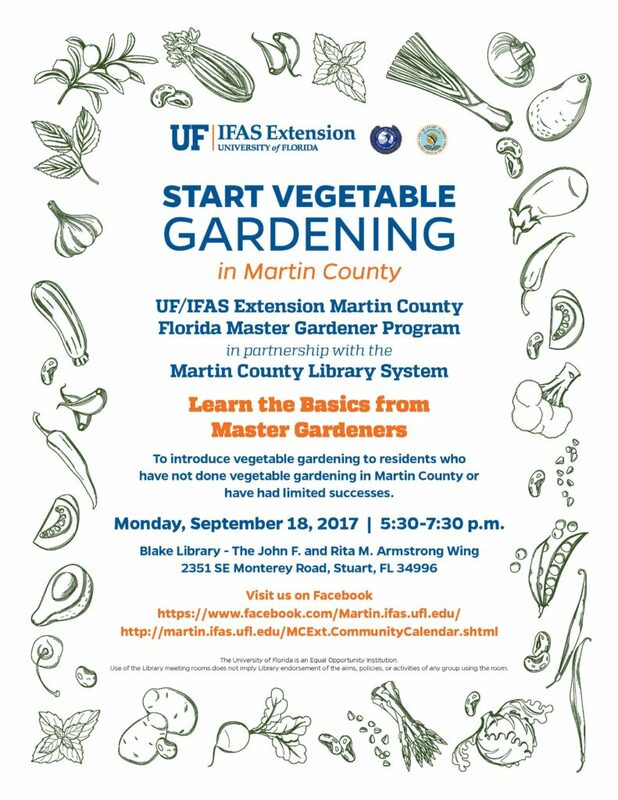 This event is geared to the FIRST-TIME VEGETABLE GARDENER in Martin County as well as those who have had limited success.